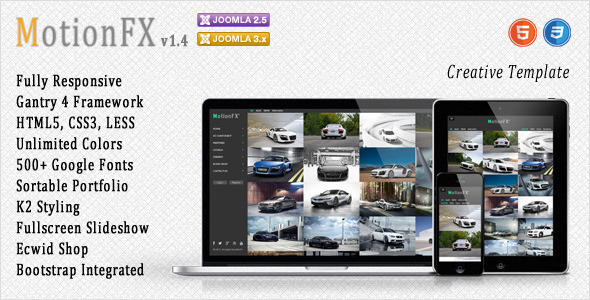 Check out our best selling Joomla template – InsightFX v2! MotionFX is an amazing Joomla 2.5/3.x template. It offers unlimited color variations, two header variations – Dark and Light and 500+ Google Fonts to choose from. MotionFX is built on the well-known Gantry Framework and it is perfect for almost all types of websites – Portfolio, Business, Blog, etc. MotionFX also comes with five homepage variations. It is simply one of the best multipurpose templates available on the Web! Important – the BT Background Slideshow Module, responsible for the Slideshow Homepage and for the Background Slideshows on some of the pages, is NOT included in the Download Package. It needs to be purchased separately as it is a BowThemes copyrighted product. You will find very detailed instructions and screenshots about the BT Background Slideshow Module configuration in the Documentation that comes bundled in the Download Package. Unlimited Color Variations, two Header variations – Light and Dark. - Fixed minor styling issues with Ecwid. - Made some improvements in the Documentation.